The International Manufacturing Technology Show, IMTS, takes place this week in Chicago. It has a lot of meaning and symbolism for me. It brings the community of those who make manufacturing their life’s work together in one place every two years. A lot of the folks walking the floor and manning the exhibits are grizzled veterans of a dozen or more of these grueling events. They are filled with memories of past shows and the characters, some dead and many retired, who walked the aisles and shared drinks in the evenings. IMTS to me is a testament to grit, stamina and endurance. I was reminded of this while many of you were watching the NFL games Sunday. I was watching the US Open Tennis Tournament. 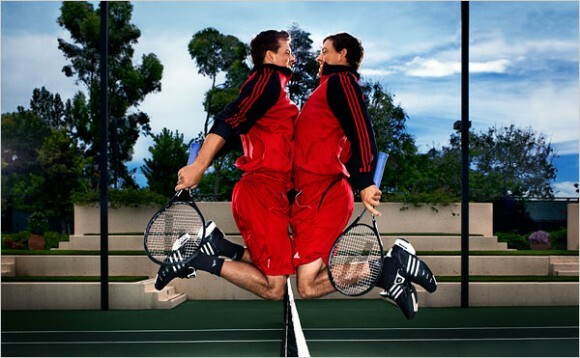 I saw the Bryan brothers, Bob and Mike, win their 16th Grand Slam doubles tournament together at age 36 (they are twins). It was their 100th tour tournament win. They have been playing tournament tennis since they were six. Their last Major win was at Wimbledon in 2013, but they were still the #1 seed at the US Open and won in straight sets. Their record is incredible for any pair. Staying together for so long, dealing with a million miles of travel and working as a team as brothers, with wives and children, takes remarkable stamina, endurance and probably a good shrink. Later in the day, Serena Williams won the US Open Women’s title in straight sets for her 18th Major, tying her with Chris Evert and Martina Navratilova. Serena won her first US Open of six in 1999. She has also done it while her sister Venus usually competed in the same tournaments. Serena is a remarkable player, a phenomenal physical specimen in women’s tennis, but her body type limits her foot speed. She plays to her strength, her huge serve and powerful forehand, but she has fought through self-doubt and injury, as well as the difficulties being one of the few African American big time tennis pros. Serena started winning Majors at 17 years old in 1999, the year I started Screw Machine World Magazine, the predecessor of Today’s Machining World Magazine and this online publication. I spent several hundred thousand dollars to get it off the ground and pay staff and printing bills, which overwhelmed the revenues. I believed in my ability and the concept of an interesting, provocative, non-pandering magazine for the people in the machining industry. Today the online publication is a winner financially and creatively (I hope). My tenacity has been rewarded. I think most of the people working and attending IMTS this week understand the stamina it takes to make a business work. Manufacturing requires enormous endurance and commitment to succeed. Most businesses require it. A lot of folks think that high tech businesses are a different breed, but most successful startups are the descendants of several failed attempts. The overnight successes are rare. I salute Serena and the Bryan brothers, but also the persistent, tenacious, enduring folks putting one foot in front of the other this week at McCormick Place. You are heroic in my eyes. Question: Do you like going to shows like IMTS? I thought this was a machining blog not a tennis update. Lloyd you can do better than this. I was not able to go to IMTS this year so how about something new and interesting from the show. In my early days as a cub field engineer for Warner &Then Swasey, IMTS was of full two weeks duration, with the middle Sunday an off day for everyone. I was a great learning experience in many ways, and I vividly recall the new machines and he new technologies that were introduced and demonstrated at IMTS. Then came the transition to every two years rather than five, and now the shortened version, like one full week. I agree that every five years would be often enough today, with the rapidity of technical changes, but it is my opinion that 14 or 10 days duration would be a better idea. In my early days as a cub field engineer for Warner & Swasey, IMTS was of full two weeks duration, with the middle Sunday an off day for everyone. I was a great learning experience in many ways, and I vividly recall the new machines and he new technologies that were introduced and demonstrated at IMTS. Then came the transition to every two years rather than five, and now the shortened version, like one full week. I agree that every five years would be often enough today, with the rapidity of technical changes, but it is my opinion that 14 or 10 days duration would be a better idea. I attended my first machine tool show NMTBS in 1955 at the stockyard as a research engineer for Monarch Machine Tool Company – and have attended every show since. IMTS-2014 will be my 26th show. Are the shows worth it? Yes: they encourage technology and new machine tool developments and models. Are they worth the time? Yes: they allow both the end user and machine tool builder to meet on neutral grounds. Are the shows productive? Yes: they provide a means for plant managers, tool engineers, industrial engineers, operators etc. to see in one place the advancements in all phases of manufacturing. Retired – 50 years in the machine tool business – author of The American Machine Tool Industry. P.S forget tennis – its boring and has nothing to do with the industry. I use sports often in the blogs because it is a convenient way to connect with other issues without hitting the readers on the head with some brilliant notion I’ve come with. Sometimes it works, sometimes it doesn’t. Maybe the readers don’t love tennis the way I do. Unfortunately I’m not into Nascar.